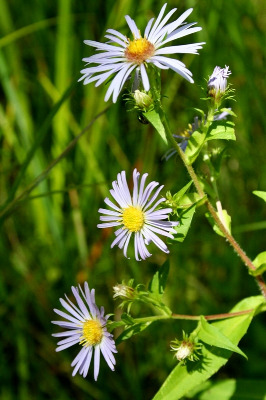 Aster puniceus of Michigan Flora. Edges of moist forests, thickets, marshes; swamps (cedar and other conifers, hardwoods), wet hollows, fens, sedge meadows, shores, swales, ditches, stream and river banks. Flower color tends to be a deeper blue than in S. firmum, and the stem is fairly uniformly bristly pubescent its entire length (though the hairs on the lower internodes may be abraded), the leaves are more hispidulous, and the internodes are longer, giving a more open or lax appearance. Plants arise from a short, stout, non-creeping rhizome, so are typically represented by scattered individuals. MICHIGAN FLORA ONLINE. A. A. Reznicek, E. G. Voss, & B. S. Walters. February 2011. University of Michigan. Web. 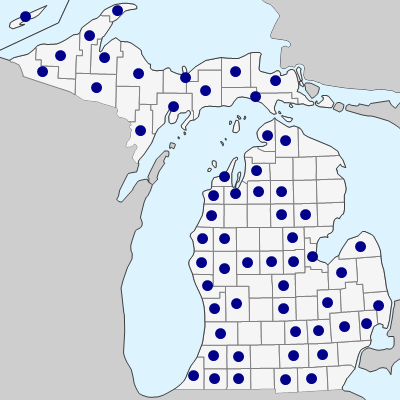 April 19, 2019. https://michiganflora.net/species.aspx?id=492.